"24th of August is the Independence Day of Ukraine. This year there was a special 3D light show projected on the building of the Kharkiv Regional Institute of Public Administration, Ukraine. 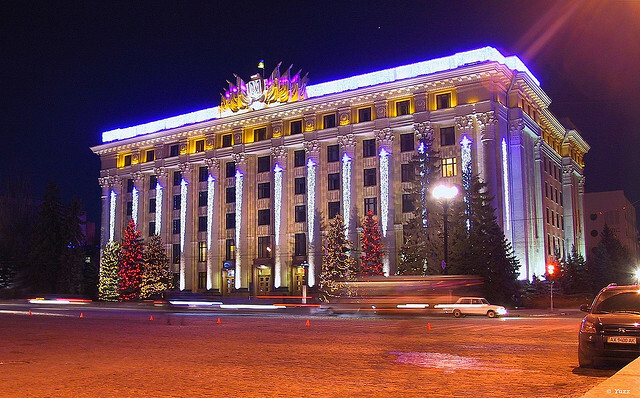 This is how the "Oblsovet" building, Kharkov, Ukraine looks like during Christmas. Picture credits to Yurr B"
Check out the light show they project onto this building. Pretty amazing. This shows some of their capabilities. Add in hologram technology. Add in a cloud cover. Extrapolate. h/t to Socio-Economics History (blogroll) for the video, and many other excellent videos. Wow A.P. That’s the trippiest thing I’ve seen in a long time – and I’m still sober. isn't that something? i figure this is a taste of what they have planned for the alien invasion show. That was cool! Extrapolating now.